ln the daily life of a cell, vesicles and organelles shuttle along filament tracks, DNA unwinds, and mRNA is delivered to its proper destination. Cell motility—the movement of cells and their internal parts—is crucial to biology, often a matter of life or death. Without this ability, cells would be unable to respond to signaling cues, to proliferate, or to fight diseases in the body. The drivers of cell motility, motor proteins, are molecules that can travel along the surface of a substrate. That substrate can be either DNA or the cell’s internal scaffolding, or cytoskeleton, which is made up of actin filaments and microtubules. Researchers have made recent strides towards determining how fast motors move with or without cargo, and what happens to the movement in a natural cell environment or in complex in vitro setups. Standard labeling techniques using fluorescent dyes and large (micron-size) beads, coupled with advances in camera and microscope speed, have driven the field forward. Now the limit is not so much technology as creativity in devising new in vitro and in vivo assays to capture a motor’s true abilities, notes physiologist Erika Holzbaur at the University of Pennsylvania. Although the field is dominated by a small crowd of biophysicists, techniques are becoming increasingly accessible to biologists. But as technical advances continue to mount, even experts face technical challenges in everything from sample prep to analysis. Creating in vitro assays that recapitulate features of the living cell isn’t easy, for example, and most data-analysis techniques are challenging to automate. And traditional techniques used to analyze motors on the cell’s cytoskeleton don’t always work well with DNA-based motors. In many single-molecule studies of motors, the actin filament or other filament track is attached firmly to a glass slide or other flat surface, constraining the molecular motor to walk only on the exposed side of the filament. Goldman’s team wanted a setup that would enable greater freedom of myosin’s motion. As a graduate student at Penn, Arsenault used photolithography techniques to etch a trench 7 microns wide and 1 micron deep on a glass coverslip, across which the actin is stretched like a tightrope using electric fields. That exposed all sides of the filament and let it fluctuate in space. The group then attached beads coated with myosin molecules to the filaments and watched the beads move under a light microscope. “Since [actin] was away from the surface, the motors were free to walk,” Arsenault says. To study the motion of myosin, the group suspended the actin filaments across the gaps and controlled their positions using dielectrophoresis, a method of manipulating uncharged particles by providing a certain type of electric field. Gold electrodes were attached to either side of the trench and an AC current was applied across them. This polarized the actin filaments and attracted them to the trench, making them taut enough that adding the bead did not cause them to droop. Evaporating gold on glass and then etching a small channel in the coverslip is a very simple procedure, Arsenault says. The filament should be elevated so that it’s within working distance of your microscope objective. You’ll need to know approximately how long and elastic your filament is to know how deep and wide to dig the trench, he adds, but you can calculate that using basic techniques in polymer mechanics. Although Arsenault used large beads, which could be seen under a light microscope, Goldman’s group went on to use smaller, fluorophore labels which require total internal reflection fluorescence (TIRF) microscopy (Nat Struct Mol Biol, 17:485-91, 2010). That approach allowed them to see single-molecule movement. DR. DAN KALMAN / PHOTO RESEARCHRS, INC. Many labs are using live imaging to understand how individual cargoes such as mitochondria or lysosomes move along tracks within cells. Most analyze the data by manually flicking through video footage of the cargo, frame by frame. “As you can imagine, it’s time intensive and error prone, and the problem is that you’re going to have to make certain underlying assumptions to analyze that complicated data,” Holzbaur says, such as counting only cargoes moving above a certain speed. Holzbaur’s team needed a more efficient and unbiased way to track movement. The team automated the task using a freely available algorithm initially developed by Felix Ruhnow at the Max Planck Institute of Molecular Cell Biology and Genetics in Dresden, Germany. The technique allowed the group to observe the motility of the vesicle population as a whole and to categorize types of motility acting on vesicles. Using the automated tracking, they found to their surprise that much of vesicles’ movement is not directed, as researchers had assumed, but appears to be stochastic, with many of the motors competing with one another (Curr Biol, 20:697-702, 2010). Other labs have come up with different automated tracking protocols, but most such systems—including hers—still get confused in complex in vitro setups, Holzbaur says. For example, after two motors collide, the algorithms cannot tell which is which as they drift apart again. That may affect how researchers determine the end of a so-called “run”—an unbroken movement in one direction along the filament. “It’s slightly less confusing if you’re a person and you’re looking at it, but there is always going to be some uncertainty here,” she adds. Several years ago, Dixit was trying to study in vitro how so-called end-binding proteins were drawn to the growing ends of microtubules. “It had been seen in the cell for many years, and no one had been able to recapitulate it outside of the cell,” says Ross, who was brought in to help devise an assay to do just that. One problem was that tubulin, the protein that makes up microtubules, tended to stick to the glass slide. Although Ross could see the filaments growing, glass was sucking up her fluorescently labeled tubules, boosting the background fluorescence as high as the signal of the growing filament. “There were a lot of glass surface modifications that we had to do in order to get it so that it wasn’t binding everything as it came along,” Ross says. The duo needed a more efficient way to study microtubules, and one that would anchor the microtubules in the middle, leaving the ends free to grow. Ross improved on an in vitro system (Methods Cell Biol, 95:543-54, 2010) that relied on a simple flow chamber. A glass coverslip is adhered to a glass slide with two pieces of double-sided sticky tape at each end. The tape holds the coverslip and slide slightly apart, forming a narrow space that serves as the channel. Ross pipetted various liquids through the channel, starting with antibodies to biotin, which stick to glass slides, followed by the crucial advance to the technique: a polymer that coats the glass and prevents free tubulin and additional proteins from adhering. Next, she added biotin-labeled microtubules, which stuck to the antibodies. After adding tubulin pieces and fluorescently labeled end-binding proteins, the group was able to track microtubule growth. Using the sample preparation helped resolve a controversy about how end-binding proteins attach to microtubules. “It’s not the same protein that comes by and rides the ends,” she says. “There are actually different proteins that are turning over.” The finding would have been too difficult to see in live cells, she adds. Enzymes that shuttle along DNA, which are also considered motor proteins, modify the shape of a DNA molecule by, for example, relieving the twisting that accumulates during transcription and replication. The traditional technique for investigating molecular motors—optical tweezers—doesn’t carry over well to DNA-based motors. Optical tweezers are essentially laser beams that physically hold and move motor proteins and molecules attached to them, but the force they apply to the molecule isn’t constant, and DNA is more sensitive to such changes than are microtubules and actin filaments. What’s more, the lasers are extremely sensitive to temperature changes—also a problem for DNA—and they are costly. In 1996, Bensimon and Croquette invented a magnetic trap, which applies a more constant force to individual DNA molecules. The trap is a set of magnets only a few millimeters long that allows one to pull and twist a DNA molecule whose end is tethered to a glass surface. The other end of the DNA is attached to a magnetic bead, which is controlled by the magnets. Rotating them maintains and manipulates the twist in the DNA while measuring different aspects of the DNA-based motors. The technique is only now becoming more accessible to nonbiophysicists, with the release of the first tabletop instrument, designed by Croquette and dubbed the PicoTwist Magnetic Trap apparatus. It costs roughly $130,000 and consists of a microscope, a set of strong magnets mounted on a motorized stage, and a computer equipped with software that drives the motion of the magnets and acquires data. Unlike optical tweezers, with magnetic tweezers “you can monitor multiple beads simultaneously,” Bensimon says, allowing researchers to get more data faster. Even without the PicoTwist, setting up magnetic tweezers is relatively simple, Bensimon says: he, Omar Saleh at the University of California, Santa Barbara, and colleagues recently published a step-by-step protocol (Methods Enzymol, 475:297-320, 2010). Still, you’ll need special bead-tracking software to measure length and force . 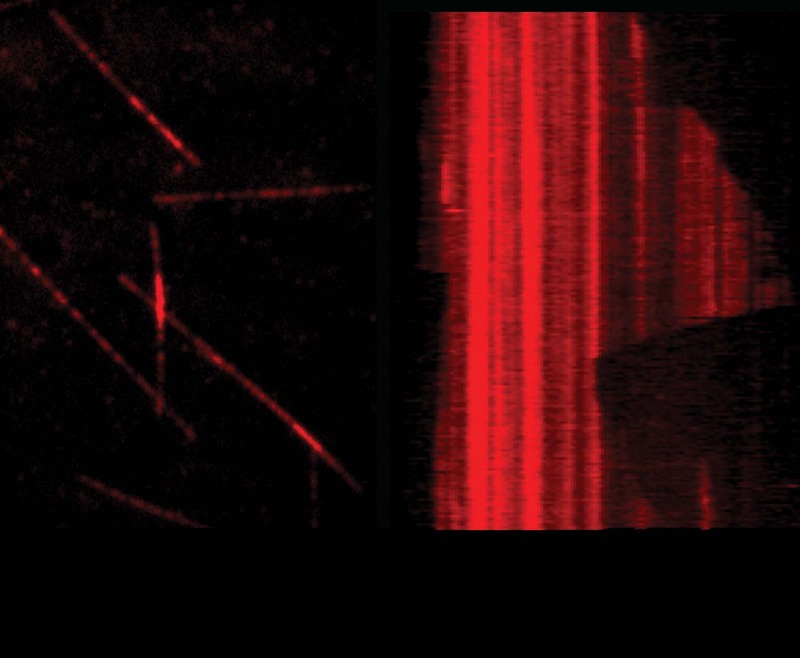 Magnetic traps currently can’t analyze molecular motors that work on cytoskeletal proteins like actin and tubulin. Saleh’s group is working on tweaking the technique to make this possible, but for now, optical tweezers are still the best choice there. Optical tweezers also have a higher resolution than do magnetic traps.